This Kit contains everything you need to make repairs to virtually any type of Vinyl. 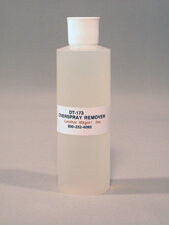 The Leather Magic Vinyl Repair Kit has been especially designed to repair damaged vinyl material. This kit will enable you to make permanent, invisible repairs to any type of vinyl fabric. The process is extremely easy to do, and will require about thirty minutes to complete. The repair compounds are heat cured, which means that, in effect, you will be actually welding the vinyl back together. This is accomplished by using the Professional Style Heat Curing Tool that is included in the kit. Once the repair is complete, the item may be immediately placed back into service. Plenty of repair materials are included in the kit so that many repairs may be made as the need arises.